Knoco stories: Wikis - to edit, or not to edit? 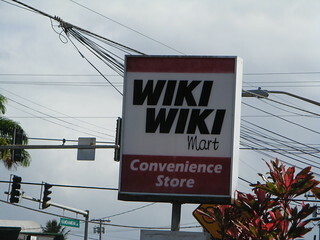 Wikis - to edit, or not to edit? There are two main approaches to Wikis as a Knowledge Management component - providing page editors who act as validators or gatekeepers, or allowing free editing. In the first case, the contents of the wiki page can be edited by only a few people, while others can suggest edits, or comment on existing content, by using the comments facility. In the second case, everyone has editing rights, and the assumption is that if enough people edit, the wiki is self-correcting and that errors and opinions will not last in the long term. The second model is often quoted as the Wikipedia model, although even Wikipedia is not so simple to edit. Although everyone can make minor edits, the protocol is to discuss major edits in the article discussion/talk page prior to publishing, and even on Wikipedia there are locked pages that only approved people can edit. Before we look at each model, we need to consider that knowledge in an organisation generally has three levels of validity. 1. Mandatory, or “Must Do” knowledge. This is the level of company standards, and everybody reading this particular guidance document realises that they need to follow exactly what’s written. If there is a major problem, they need to get in touch with the process owner and discuss it with them, but that the default should be to follow this documentation exactly. 2. Advisory, or “Should Do” knowledge. This is the level of best practices, and everybody reading this particular process documentation realises that this is current best way to approach this particular process, based on existing company knowledge. However there is always a drive to improve on best practice, and if somebody can find an even better way, then that’s great. So Advisory process is advised, but not compulsory. However if people ignore advisory knowledge and things go wrong, some awkward questions may be asked. Level three is the chit-chat level of knowledge, in social media, discussion forums or meetings, where ideas and opinions are kicked around and solidified over time. There is a validation step to move from level 3 to level 2 (validation by SMEs or a Community of Practice), and another validation step (validation by the company) to move from level 2 to level 1. The question is - what knowledge do you want to host on your Wiki? Level 3, or level 2? "This wiki is both a working area for the Knowledge Management for Development (KM4Dev) community and a way for us to make our joint work accessible to a wider audience"
Wikis in places like Shell, Pfizer and Conoco use the wiki for level 2. Level 1 knowledge is held in the discussion forums and lessons management systems, and the wiki page editor promotes content to the wiki once it is considered "valid". They make reference to level 1 knowledge by linking to official procedure documents and standards. Wikipedia, without making this explicit, is primarily for level 2 knowledge. The article discussion/talk pages are where the level 3 interchange happens, and the promotion of major edits to the main page is by "editorial consensus". If you are using your wiki for level 3 knowledge, then allow everyone to edit. If you are using your wiki for level 2, then a) introduce a validation step, and b) decide where your level 3 conversations will take place.